Aboard the ultra-luxurious, award-winning Crystal Serenity, you will experience the refined elegance in a casual and unpretentious atmosphere. With an emphasis on innovative product differentiation, the renowned Crystal Experience is distinguished by classic service, abundant space, superior quality and extensive choices, providing worldwide vacations that bridge the best of land and sea. 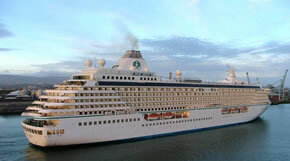 The Crystal Serenity was launched in July 2003. 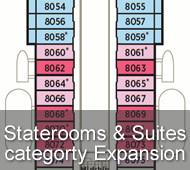 This 68,000 tons vessel is designed to accommodate 1,080 guests, the Crystal Serenity set the new standard in luxury cruising. 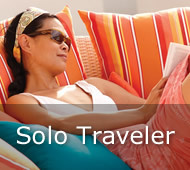 While she is 36% larger than her sister ship, Crystal Symphony, she carries only 140 more guests. With over 94,000 square feet of public space, you'll never feel crowded. 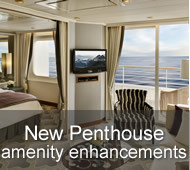 The Serenity features an additional deck dedicated to luxury Penthouse living, and more than 85% of her staterooms offer private verandahs. On board the Crystal Serenity you will find numerous activities and a wide selection of entertainment choices for you to enjoy. Whether your preference includes the ultimate relaxation, keeping up with or starting a new fitness routine, or basking in the 3,000 square feet of the Stars shopping arcade. 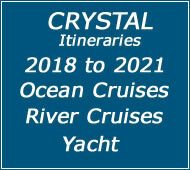 The Crystals Serenity is well endowed, with endless entertainment possibilities. 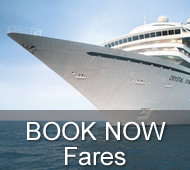 The Broadway-style shows are a highlight of every cruise. After dinner, a variety of performers from around the world, which may include Musicians, Singers, Juggler, Ventriloquist, and many more. And of course we there is always music and dancing before and after dinner hours. 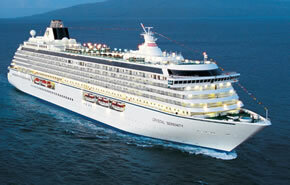 If you enjoy fine dining that defies all odds, Crystal's Serenity is the ship for you. Our chefs are trained to prepare exquisite dining that we guarantee you'll never forget. The Serenity is equipped with a variety of dinning rooms and restaurant that provides the perfect atmosphere.